It's been quite a while since I last posted. The camera has been sitting somewhat idle these last few months as I focus on some other projects. But this week, we're actually on vacation, so it seemed like a great time to pull out the camera. Fortunately, Murphy remembered how to sit and stay so I could catch his long shadow right as the sun rose. 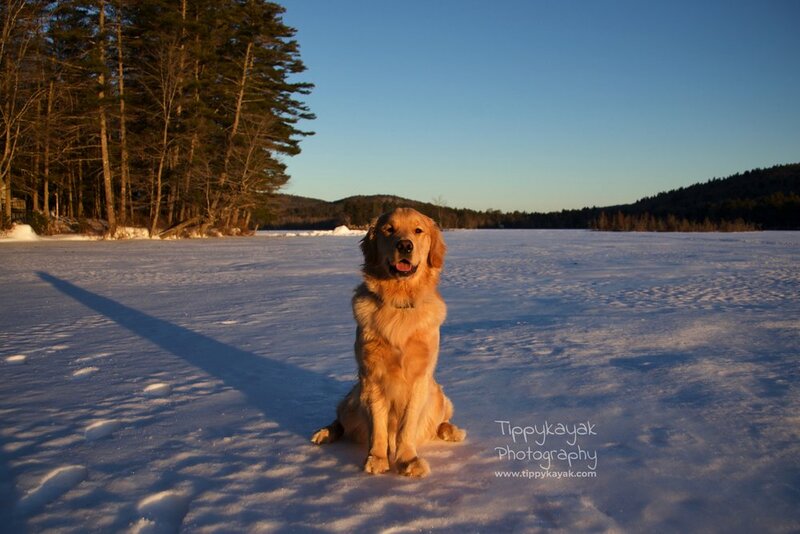 We're staying at my folks' place up in Maine this week, so the first morning, I got up with the sun and took the Goldens out on the frozen lake. Before going through the gate to the lake, though, our three had to sit and stay, and I took this photo right as I let them go. My parents' dogs came out a couple of minutes later, and I had a nice time using the golden hour of sunrise light to get a couple of cute pictures. Here's River, looking quite dashing. And then Summer, of course, got her time in the sun too. I caught some other pretty pictures of her, but this one, with her eyes closed, basking in the first light of the day, really charmed me. We can't forget Jax, of course, who was willing to sit still for a photo but looked so miserable about it that I couldn't get any good pictures. So I snapped this one when he paused for a second between tussling with the younger dogs and eating as much snow as he possibly could. Comet, of course, can hold a sit stay, even as the younger pups were running around behind me. He might be going pretty white in the face these days, but he did his share of running around and eating snow, and he can still give any of the younger dogs pretty stiff competition when it comes to a full-out sprint. This also seems like a good time to remind everyone that clicking on a picture in one of these blog posts will typically allow you to see it much larger. Since these are high-resolution photos, many of them really look wonderful when seen at a larger size. For example, the photo at the top of the entry of Murphy looks a lot better at a bigger size.